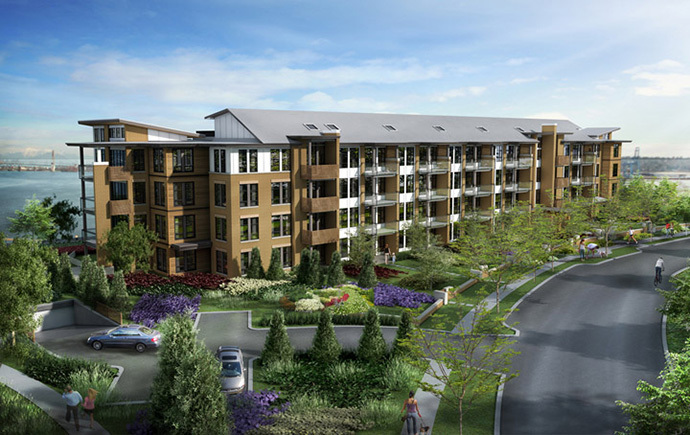 Located in the master planned Port Royal community in Queensborough New Westminster, Aragon introduces the spectacular riverside Glasshouse Lofts. True loft living experience will be available soon at the New Westminster Glasshouse Lofts at Port Royal will prospective home buyers can seek out true loft style floor plans with soaring glass walls. There will only be 67 lofts for sale at the Glasshouse New Westminster loft project in Queensborough’s Port Royal neighbourhood and this will signify the first and only ‘loft-style’ apartment building in the master planned community. The building will be a boutique low-rise residential development of only 5 floors. This is truly the last waterfront location anywhere in the Lower Mainland at an attractive price point with spectacular interior features and specifications not found anywhere else. From the signature red brick walls by Aragon to the open concept efficient floor plans, these New West lofts for sale are the perfect new home waiting for you in Queensborough waterfront real estate market. The Glasshouse New West Lofts building will be situated just next to Flo and along the beautiful Fraser river. Some of the stand out features include such things as oversized balconies that are designed with innovative folding glass doors that tuck directly up against the wall so that you have true indoor/outdoor living (like in properties in hot climates) as well as great views from select homes. As well, some of the bonus features for the penthouses in New Westminster Glasshouse Lofts in Port Royal will have an outdoor fireplace on the deck! More information is coming soon on www.aragon.ca. 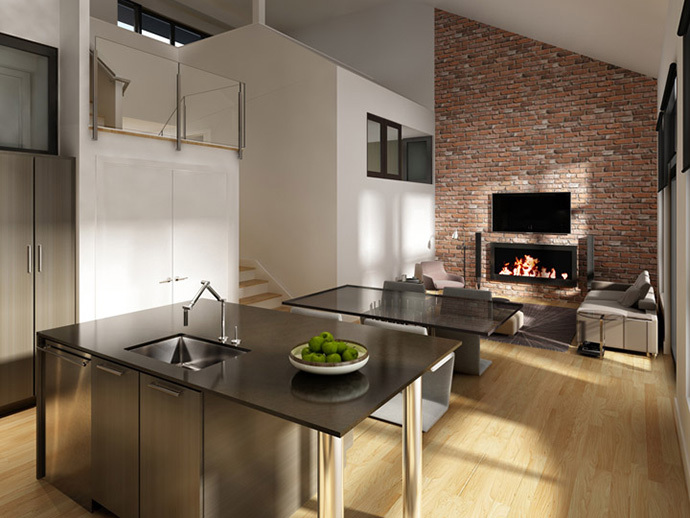 GlassHouse Lofts in New West Port Royal Neighbourhood Launching June 15th! If you are looking for a boutique waterfront New Westminster loft apartment, the new Port Royal GlassHouse Lofts development by Aragon developers is the perfect place to call home. The VIP grand opening for these waterfront New Westminster lofts is happening on June 15th, 2013 but you will need to preregister your interest to get on the VIP list! A combination of urban chic features with high ceilings and original design layouts, these lofty and airy residences will bring a new dimension to urban living in the Queensborough Port Royal master planned community designed by Aragon Developers. 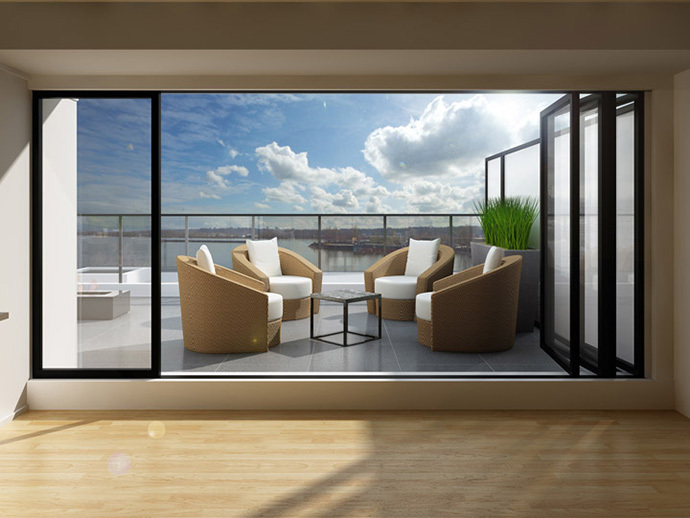 The New Westminster GlassHouse Lofts will also present incredible views of the water and beyond. The marketing tag line includes 3 words that are exactly what the project is all about: Architecture, Engineering and Imagination. 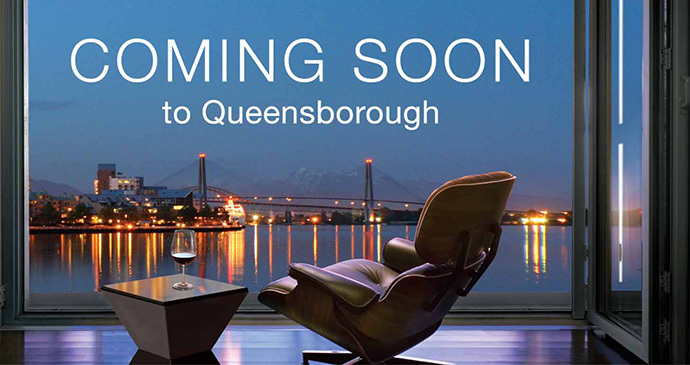 The initial presales will be launching in mid-June, but here are some of the incredible features that homebuyers can look forward to at the newest Queensborough Port Royal waterfront community. The New West Glass House Lofts will include floor plans that range from 1 to 4 bedrooms which gives home buyers plenty of choices depending on your lifestyle and requirements for space. Ideal for singles to growing families, owners can move up or move down within the same Port Royal New Westminster community without having to leave this wonderful neighbourhood. 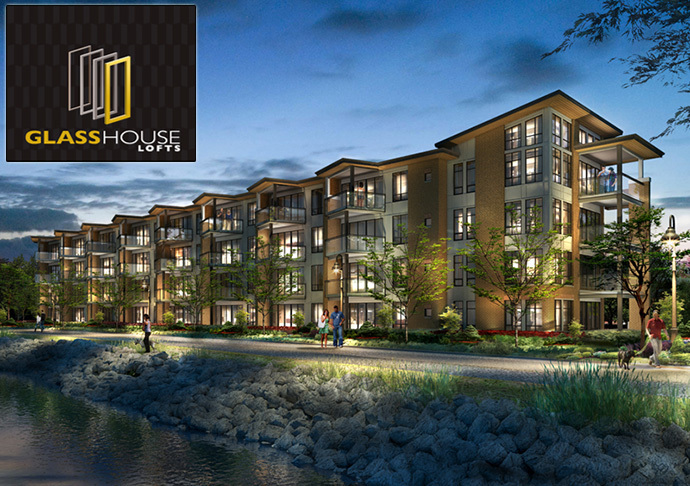 The Glass House New West waterfront condos overlook a three acre Port Royal Park (brand new) and green space. 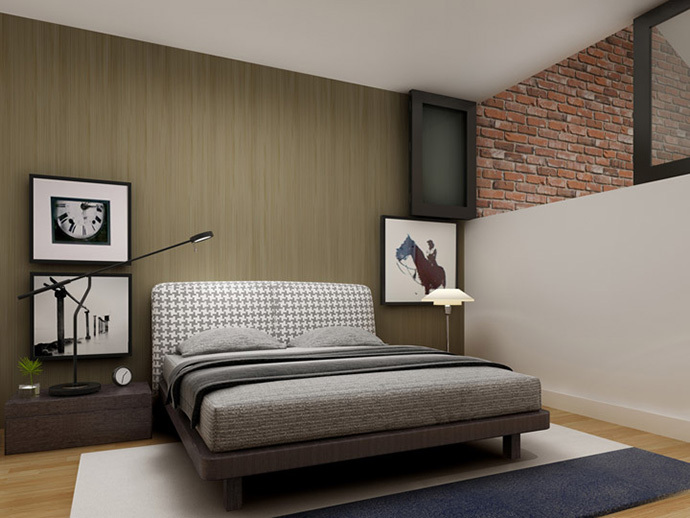 The open plan New Westminster loft floor plans will have 10 to 20 foot ceiling heights and the signature Aragon exposed reclaimed brick feature wall (they are stunning and unique)! Some of the interior features include folding picture windows that open to living spaces in the bedrooms in addition to sliding barn doors with stain aluminum pulls in the master bedrooms. Other interior features include beautiful electric fireplaces (modern style) in the living space and for those on the penthouse level, an outdoor natural gas fireplace on your terrace deck! The main living rooms will have premium white oak engineered hardwood flooring which is both durable as it is beautiful. The presale New West Glass House lofts in Port Royal Queensborough waterfront district will also feature mezzanine open to below and suites that overlook the mighty and beautiful Fraser River plus waterfront area. A truly modern and unique folding glass wall system allows for indoor – outdoor living. These glass walls open up all the way, giving you a seamless area to relax and entertain between your living/kitchen indoor area with your balcony/penthouse terrace decks. 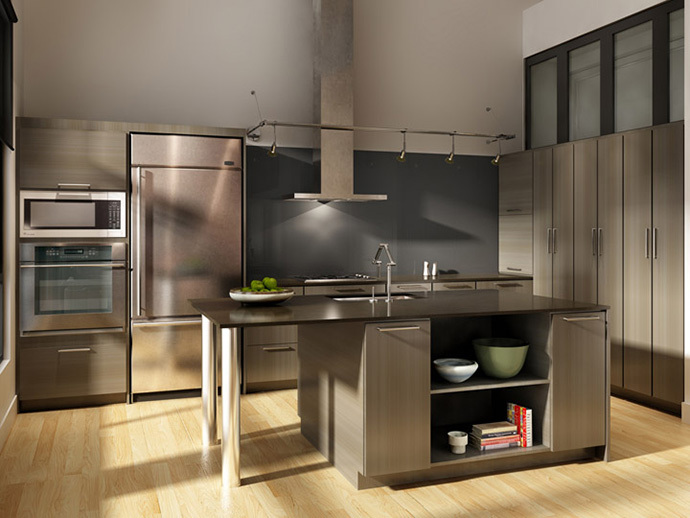 Kohler fixtures and hardwood floors are standard features. The presale New West Glass House lofts will also feature GE Monogram high-end appliances with stainless steel finish and also quartz countertops. The Glasshouse New Westminster Lofts are the last true waterfront development in the Lower Mainland. As an owner here, you will become a proud resident of the master planned Aragon Port Royal community in Queensborough. The 5 story boutique building will only feature 67 homes for sale, making the Glasshouse New Westminster lofts a premium development that is both unique as well as luxurious. The VIP Preview and grand opening for the Glasshouse New West lofts is June 15th, 2013. You won’t want to miss out on this opportunity to be amongst the very first to see the extra high ceilings, the immaculate finishing, premium fixtures and appliances, and of course the spectacular water views that make GlassHouse Lofts such a unique offering.